meaning Clifford Franklin Begnal, Clifford Anthony Begnal Young, Newton Richard Begnal Young are Eaton Descendants and the same of all Descendants are not Young's either. I am most interested in Claude Brudenell Eaton. However, knowing more about George & Mercy Ann, their children INSERT CHILDREN's NAMES in my searching for descendants, who may have completed a DNA test and who are a member of Ancestry. I met my father for the very first time 1968, prior I did not know his Name or what he looked like. My mother June E nee Wilson Young, knew my entire life who he was and how to get a hold of him. My not knowing having a reason to ask. Then in 1968 I received a letter from Richard N. Young, that he was my father and later that year we met. I now had 3 half sisters, and a half brother from 2 of his other marriages, and I was able to meet his mother Thelma Ferne Perry for the first time as well. Thelma passed in 1979. As a tribute to Thelma, I began genealogy research in 1992, and by 1994, I learned Richard N Young was not born by that name, rather Newton Richard Begnal. I asked my Father, and he said he was a Begnal, and nothing more of his growing up or about his father, which I learned eventually per my Father's birth certificate was Clifford Franklin Begnal, also confirming his Mother's name. No explanation of how Richard had the last name of Young. Thelma deceased, my Father passed on Jan 1995.
requesting a record find of a Clifford Franklin Begnal, b. 31 Mar 1903, Utica, sharing at the time that his parents were Elizabeth & George F Begnal, both replied with Birth Not Found & Possibly not recorded. In 1994 I was looking for Clifford as Begnal, not as Eaton. So for the next 24 years in researching piecing his & his mother's life together, discovered his grand-father was George Felix Begnal (1879-1957), neither men Clifford or George my Father knew or had met. All indications from records found, none pointed to George being his biological grandfather or my great-grandfather. Utica Vital Records nor New York Health Dept. could verify a birth 31 Mar 1903, Utica, Oneida Co., NY of a Clifford Franklin Begnal. Nor could I locate a marriage between George & Clifford's mother Elizabeth Shaughnessy. All records indicated that after Sep 1930, my Father was Richard N Benesh, Richard N Young, Richard N Begnal, per the 1930 census, 1930 school records, 1941 SS application, Mar 1942 marriage to a Patricia Arnold, Jul 1942 Army Enlistment, Oct 1942 birth of his daughter, another daughter born Jan 1945. ...a Rockwell (NY) 2nd Cousin, sent the following "I recently dug deeper into my mother and father’s ancestry documents and found what appears to be the solution to the conundrum you mention about Clifford Franklin Begnal parentage. Your research and instincts were right. Clifford’s parents were not Lizzie Shaughnessy and George Begnal. It turns out that Lizzie had a previous marriage. 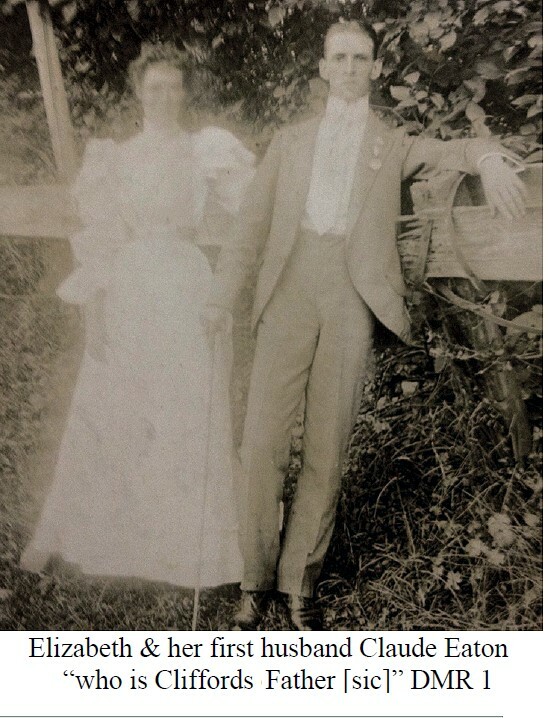 On June 13, 1900, she married Claude B. Eaton, and this union gave birth to Clifford Franklin in 1903"
Cousin Rockwell, also provided the 1900 marriage certificate, thus my New Research Quest began, hoping to connect to Eaton's on Ancestry tree's or as the result of my DNA test. 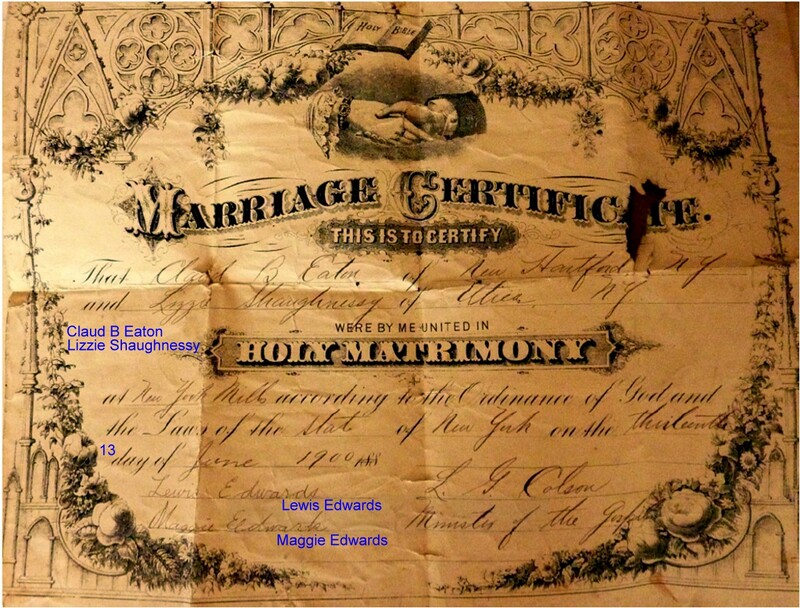 For the last 25 years, and more recent since learning of the 1900 Eaton marriage with the potential fact that Claude B Eaton maybe my true biological Great Grandfather, proving that I am neither a Young or Begnal by blood, other than those descendant of Clifford Franklin Begnal & Thelma Ferne Perry. Even Perry is not our biological surname, it derives from Pereira Cardozo, sometime prior to 1900.